Greetings! :) I hope everyone is enjoying their week so far. I am because we're at the start of another Digit-al Dozen week! This month our theme is Decades - isn't that super fun?! 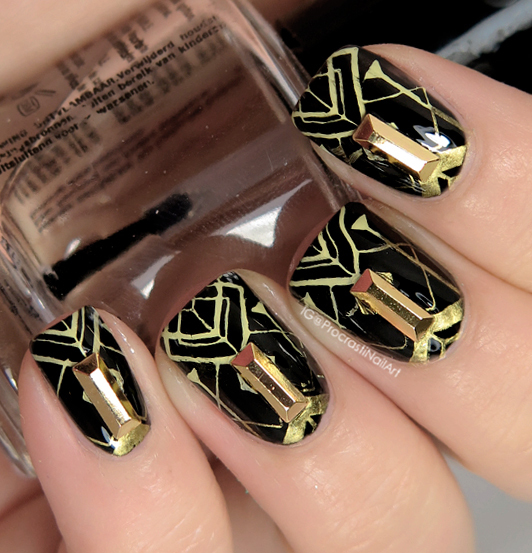 It took a while to get my inspiration going so I started out with a pretty obvious option: Art Deco nails inspired by the 1920's! It seems like a lot of us when this route for our first looks which I think is both funny and awesome. 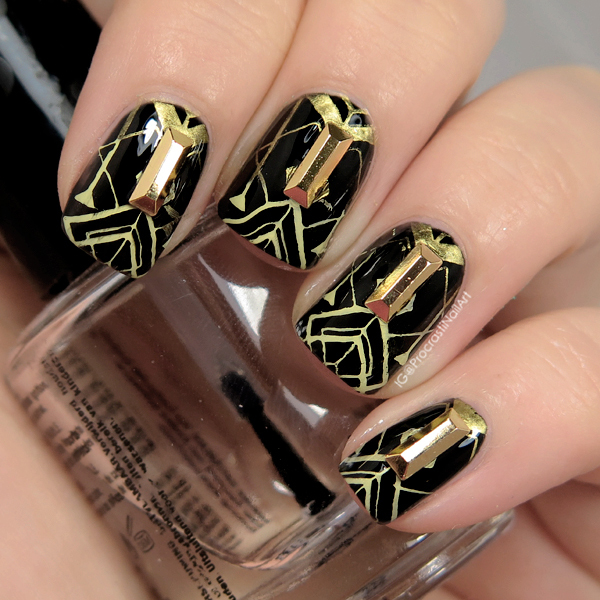 :) There are never enough golden and geometric nails in the world, imo! I got an order of a TON of new Born Pretty Store plates in the other day, and I knew I wanted to use my new BP-L054 plate for this one. Unfortunately the the corner of the plate with this design on it seems to be a bit warped so it was hell to pick up the image. :( That's why some are a bit wonky looking unfortunately. I haven't tried any other images on the plate but I'm hoping they work a bit better! When I think of art deco I think of black and gold, but I decided I wanted to do a bit of a gradient in my stamping so I did a gold-to-yellow gradient for the stamped image using Mundo de Unas Gold and Papyrus. They're applied over a base of Sinful Colors Black on Black (of course!) and I added some gold bars from Born Pretty just to finish it off. I'm pleased with my first look, though I'll admit I don't have any of the other designs for this week done yet.... Oops! I'm going to get to working on them now. In the meantime while you're waiting for the rest of my posts be sure to check out all the other awesome looks from the group for Day 1 below! 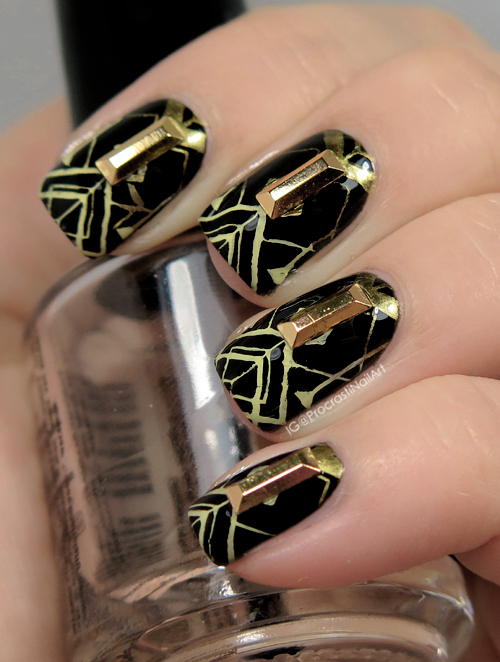 What do you think, do you like the gradient or should I just have stuck with traditional gold stamping? Let me know! I love these! Especially with the studs added. Looks fantastic! They're so wonderful! Love the studs you added, giving the whole manicure an extra dimension (both literally as figuratively!). Loving all these decade manis! This is so art deco and perfect. LOVE this!!! Suddenly I feel the urge to watch The Great Gatsby now. Wow, these are stunning! I love that you added the little 3D element!